It might have taken four days for Lake Garda's famous afternoon breeze to kick in, but it was surely worth the wait. 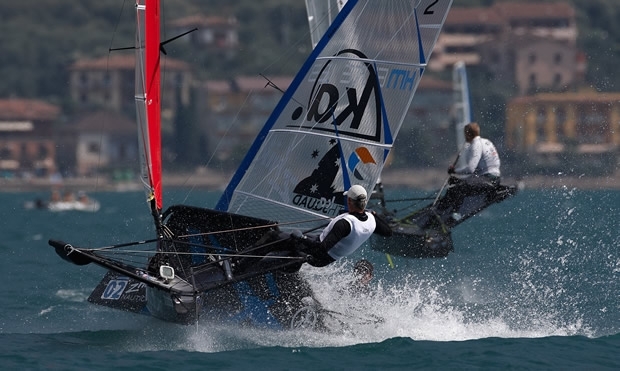 The 125 boats competing at the Zhik Moth World Championship took to the waters off Campione del Garda in fabulous conditions. The Ora kicked in on time, built to 15-16 knots. The race committee was able to lay on three spectacular races in the best breeze of the regatta to date. The fleet has now been split into Gold and Silver and as Scott Babbage mentioned earlier in the morning, competition has stepped up a level as he has to face twice as many top boats than in the qualifying series. However this didn't prevent him from scoring two more bullets today. The first race in the Gold fleet had three main contenders, all Australians. Scott Babbage and Joshua McKnight clearly dominated in conditions, slowly approaching those they are used to in Sydney, even if Babbage still finds them “pretty light”. The two sparring partners were a long way in front of the fleet, with McKnight leading three quarters of the way through. However, Babbage was faster downwind and crossed the finish line ahead. Joe Turner, the third Australian, stole the spotlight in that first race but, unfortunately, for the wrong reason. While going on the top reach to the distance marker, he lost control of his boat and pitchpoled right in front of fellow countryman John Harris. Harris had no time or room to react and crashed into him. As a result, Turner's boat suffered serious damage that, although repairable, puts an abrupt end to his aspirations to the world title. Although he likes the strong breeze, Babbage did equally well, or even better, in the softening conditions of the second race. He led from the outset and extended his cushion over second-placed Anthony Kotoun to dozens of boatlengths at the second weather mark. There was nothing Kotoun could do to bridge the gap, but still held on to his position, crossing the finish line ahead of Rob Gough and Joshua McKnight. In the day's last race Babbage and and McKnight inverted their positions with the younger Australian taking the win. It didn't come so easy though. McKnight was in the lead at the first top mark but Babbage got him at the bottom mark. Still, McKnight was again faster upwind and overtook him. Three more races are scheduled for both of the fleets on Saturday, starting again at 1400 local time. As the weather patterns are converging to the usual ones on lake Garda this time of the year, we could very well witness another day of champagne sailing for the Moths.